As insurance prices continue to rise, particularly for young drivers, so does the popularity of telematics based insurance systems, which measure your driving style and reward safe, careful drivers with a lower insurance premium. Unfortunately, though, these insurance policies require you to have a ‘black box’ installed in your car that monitors things like speed, acceleration, braking, cornering force, types of road and time of day. These details are then passed on to the insurer, who will reward (or penalise) you accordingly. It’s called MotorMate, and the interface is incredibly simple – you just press the big green button to start the app and then leave it running while you drive, then turn it off when you arrive. You’re then given a star rating for your and after 250 miles you get an overall score. Confused.com will give you rewards like a phone cradle, cashback and money off insurance for using the app, too, so it’s worth trying. In order to use your app you need an up-to-date iPhone or Anrdoid smartphone with GPS capability – it doesn’t rely on a 3G connection to work, so no worries about dropping signal midway through an epic road trip. It monitors the type of road you’re driving on, acceleration, corning speed, braking, and time of day, just like a proper telematics system. We’ve been using the app for a few weeks now and managed to tot up the full 250 miles to get a rating, scoring a not-too-shabby 59%, which MotorMate calls ‘Marvellous Motorist.’ This score is despite a few trips where the score was pretty bad, perhaps due to extended runs at busy times of day on the motorway. Nontheless, we didn’t do too badly and we really weren’t trying to please the app, so it goes to show you don’t have to drive like saint if you elect to have a full telematics system installed in your car, just as long as you’re not dangerous. It’s very interesting to see how you're driving and see how your improvments alter your journey score. 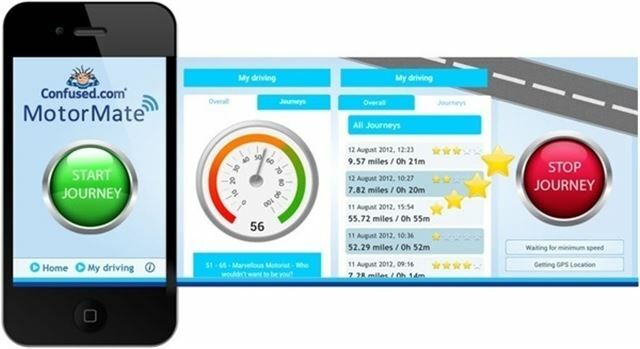 On top of that it's well worth trying if you’re struggling to find low price insurance but don’t want to take the telematics plunge straight away.You’ll find the app here.